I love my iPhone and I also love the different cases that there are available for it. But sometimes I want something just a little bit more special. Something a little bit more personal and unique maybe. Of course I could just order a case with a personal photo on it. But why should I do that if I could also make my own DIY photo iPhone case ? 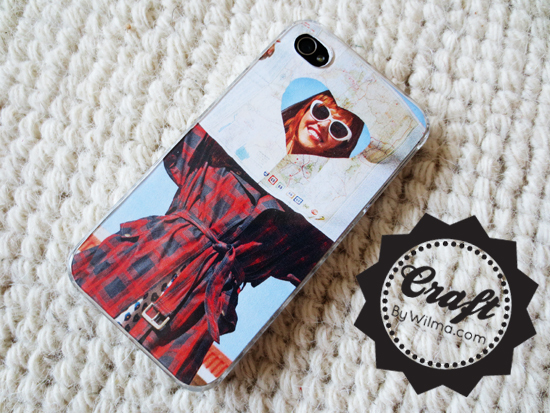 Best thing: you can change the photo on this DIY iPhone case as many times as you want plus it’s way cheaper! In just a few weeks I know I have some cute baby pictures that I want on the back of my iPhone but for now I choose a great picture that I found in a magazine. This really is the easiest and quickest way to make an iPhone photo case! Learn how to make your own DIY iPhone photo case after the jump. . .
1. Decide which part of the picture you want to use for your case. You can do this by putting the clear case on top of your photo. 2. Trace around your iPhone and cut the photo out. for this. This makes it easier and more precise!